The Committee is pleased to announce that Tadhg Lambe has been appointed as our first Director of Tennis. Tadhg brings to this key role a wealth of experience across all facets of the sport. Tadhg has worked at the highest domestic level with Leinster and Munster Branch Coaching Squads for many years. In recent years, as the National Training Programme developed, he has worked individually with some of the most talented Junior players. 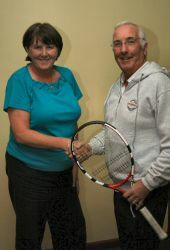 He worked for 6 years from 2001 to 2006 as Director of Tennis in Limerick LTC, a 12-court club, developing similar programmes as we expect to see in Brookfield. Tadhg has worked with players of all standards as a coach in clubs and schools across the country. As the senior Tennis Ireland Coach Education Tutor, over the last 20 years Tadhg has trained coaches from the Level 1 up to the highest National grade of Level 3. He himself is a Level 3 coach and besides being a regular participant at World and European Conferences he has worked with international coaches such as Ivo Van Aken, Louis Cayer, Leif Dahlgren and Frank Van Freyenhoven. 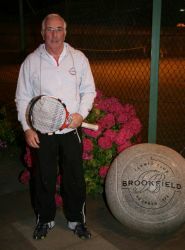 As a player, Tadhg was a leading member of the Sutton 5-in-a-row Class 1 winning team in the 1970s and won numerous tournaments.